I am a wife, mom, sister, friend, mother-in-law and grandmother to two beautiful girls Madison and Abigail. Being a grandmother is one of the very best things in the world. I am also mom to three dogs, Ginger, Petey and Lucy. I love to create. 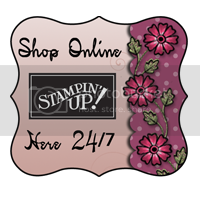 A little over a year ago, I was searching online for a punch and I came across Stampin'Up! I found exactly what I was looking for and so much more. I have been scrapbooking for years but I never really stamped that much. Looking at all the beautiful card examples and projects online really got my interest. I loved everything, all the stamps, papers, colors...everything! I put my order in and could hardly wait to get my products. When I received my box of goodies I was so impressed by the quality of the products. One of the items that I purchased was a set of markers and the colors were gorgeous! Well, I got back online to see what else I wanted to order and read about becoming a demonstrator. What could be better,working doing what you love, meeting great people and making money at the same time. I signed up right then and there online.